Mason’s annual International Week takes place from Friday, April 6 until Sunday, April 15, 2018. 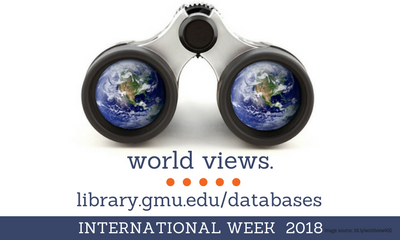 Mason Libraries is committed to exploring global perspectives! One way the Libraries achieves this is by acquiring a variety of online resources for students, faculty and staff to help them learn, teach, and succeed. Resources include a wide array of foreign language resources, ranging from books, e-books, scholarly journals, juvenile literature, music and movies. Use Quick Search, the Libraries’ Catalog, Subject Guides, or the Database List to browse, locate and use the materials. Explore these resources and more with the Mason Libraries! 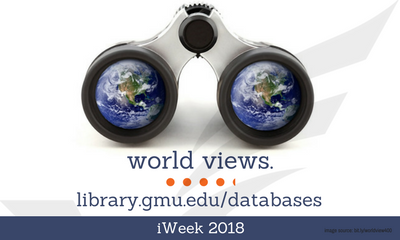 This entry was posted in Faculty, FYI, Graduate Students, Mason Libraries Collections, News, Online Resources, Undergraduate Students by Jessica Clark. Bookmark the permalink.